Do you wake up with a sore back every morning because you are stuck with a mattress that simply doesn’t work with your body type? Do you feel like your mattress just doesn’t support your weight effectively, or that your mattress sags under the weight of your body instead of distributing it evenly? It can be difficult to find a mattress that works for those of us who are a bit heavier and if it seems like most mattresses are made for those with average body weight, you would be correct. Many people simply do not realise that mattresses come in all different styles and thicknesses and the one you choose should be dependent on how much you weigh, among other needs. The Loom & Leaf Luxury Memory Foam Bed offers luxury quality at a great price. For customers who are looking for that memory foam feel, they are a great option for a mattress that can give some of the same features of luxury branded mattresses but at less than half the price. And best of all, it’s perfectly designed for heavier customers that need a bit of extra support. 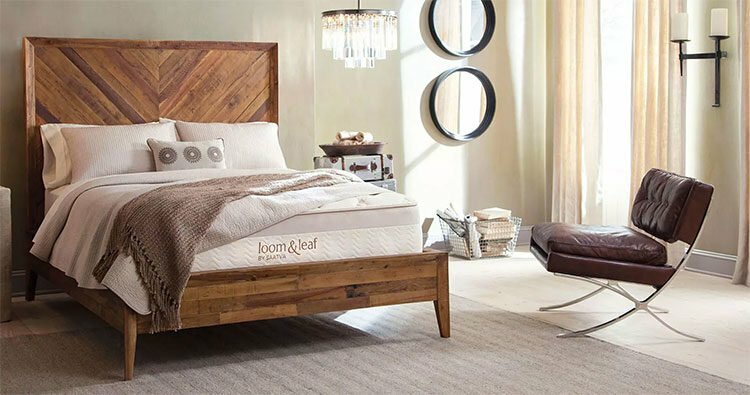 The Loom & Leaf Luxury Memory Foam bed is great for customers who want a top-quality bed that has many of the features of a Postur-Pedic mattress but without the hefty price tag. They offer two comfort level choices–“relaxed firm” and “firm” but even the “relaxed-firm” option sits at the firm end of the mattress scale, so this could be a great mattress for heavier people that need a lot of support and structure. High density foam prevents sagging under body weight and enhances the durability and life of the bed. Unlike cheaper foam based mattresses that are just a solid chunk of foam, the Loom & Leaf bed has a number of supportive layers. Starting with a large section of support foam, the bottom portion of the mattress has airflow channels built in to promote coolness. Next up is a 5-pound layer of memory foam. This is topped with a layer of cooling gel which works to regulate body heat. And this is all topped with a quilted, organic cotton cover which works to promote breathability and wick away moisture. Because of the high-density construction of this mattress, this might be a good option for people who like the feel of memory foam but are looking for a bit more firmness than other memory foam mattresses. Highly rated in the area of motion isolation, this is a great option for partners who are light sleepers or people who wake up easily from their own turning. The density and firmness of this bed means the mattress stays in place and absorbs motion. Furthermore, this mattress has great feedback from customers over 230 pounds who sleep on their backs, stomach and sides, particularly the “relaxed firm” model. 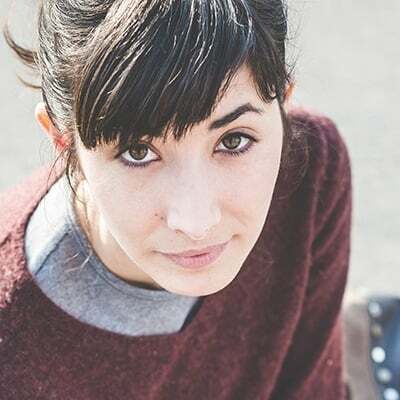 However, if you share the bed, this mattress might not be great for someone under 130 pounds as they might not be heavy enough to take advantage of the body conforming memory foam. Loom & Leaf use many natural materials in the construction of their mattress. Besides the organic cotton cover, they use a natural thistle based flame retardant and although the foam is still largely petroleum based, about thirty percent is made from corn or soy based materials. As well, their mattresses aren’t sprayed with any chemicals and there is no formaldehyde, pthlalates or other harmless chemicals in the mattress. The Loom & Leaf mattress comes with an impressive trial period and you are allowed to try the bed for 120 days as compared to the similarly built Tempur-Pedic model which offers one month less. The warranty is also longer than the Tempur-Pedic model at 15 years rather than their 10. You want a firm mattress: Loom & Leaf makes mattresses at two comfort levels and if a firm mattress is what you need you can choose their “firm” option or if you need the support of a firm mattress but like that “sinking in” feel of memory foam, there is the “relaxed firm” option. You want a mattress that contains some natural materials: If you are concerned about chemical or synthetic materials or have environmental sensitivities against mattresses that need airing out, this could be the mattress for you. You sleep hot: This mattress has a cooling gel layer under the cover so if you are a hot sleeper, cooling gel can help with this for some people. While a few customers report feeling hot with his bed, most are satisfied with the gel’s cooling ability. You want a long in home trial period and a decent warranty: With a 120-day trial period and a 15-year warranty against manufacturing defects, this mattress is really good value. You are on a budget: If you are looking for a bed with great reviews at a lower price point than similarly structured mattresses, Loom & Leaf is a great option. You want a bed ready to go: Loom & Leaf beds are not compressed and are delivered and set up for you. If you have mobility issues or can’t move or set up your own bed, this is a great option. 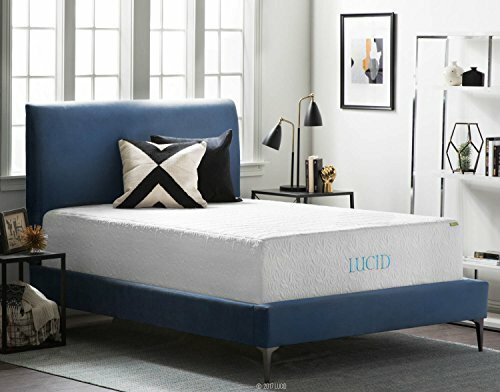 Just because you are on the heavy side doesn’t mean you necessarily want a hard bed and the LUCID 16-inch Plush Memory Foam and Latex Mattress offers an alternative for those who want support and weight distribution but still want that plush, luxurious feel of memory foam. This mattress offers a mix of various types of foam, each with their purpose. The bottom layer that makes up the foundation of the mattress is made to be supportive and motion absorbing so it’s a ten-inch-thick piece of high density foam. Above this is a two-inch layer of natural latex foam and then a three-inch layer of memory foam for comfort and provides that plush feel that memory foam is known for. On the top is another layer of memory foam, this time bamboo charcoal infused with a Tencel blend cover. Not only is bamboo charcoal antibacterial and odor neutralizing, it is meant to make the surface of the mattress more breathable. This is important because any time you have a mattress made predominantly of memory foam, you are going to have some extra heat generation coming from the bed contouring around your body shape. And like the Tempur-Pedic model, this mattress cover is removable and washable. Since the upper layer has this thick memory foam layer, this mattress has a bit more of a plush feel than some of the other, firmer mattresses with gel or pillow tops. The memory foam provides more sinkage and a hugging feeling compared with a firm or extra firm mattress and is good for those who have sore hips or sensitive pressure points. Despite the plush feel there are still some customers who feel that this bed was too firm for them so if you have never used a foam bed before, or if you are on the petite side, keep this in mind. Overall, customers experienced with memory foam beds found this bed on the softer end of the firmness scale and heavier customers have overall been satisfied. With a 25-year warranty, the LUCID mattress has one of the longest warranties on the mattress market, which is a nice bonus. You want a plush mattress: This mattress is known for its softness. While it has a 10-inch layer of high density support foam at its base for support, it offers the luxurious, contouring sinkage of memory foam layers. You are a light sleeper: The firm structure of this mattress and the structure of the layers makes for little motion transfer. This bed is a great option if you are having problems with your partner waking you up from their movement. You want a mattress with a long lifespan: Tempur-Pedic mattresses are pricey but they are known for lasting a long time with a great customer satisfaction rate. You want an extra firm mattress: The TEMPUR-Contour mattress is the firmest mattress Tempur-Pedic makes and one of the firmest all foam mattresses on the market. If you find that you just can’t find a bed that is firm enough for you, this might be your best chance. If you prefer the pushback feel of an innerspring mattress, a hybrid mattress might just offer you the best of both worlds. The WinkBeds Luxury Hybrid Mattress gives you the luxury feel of a foam mattress but with the support of innerspring design that heavier customers might appreciate. Rated as a medium-firm hybrid bed, the WinkBeds mattress is made with alternating coil and foam layers. Two inches of support foam at the bottom forms the base of the mattress. Above this sits a seven-and-a-half-inch layer of tempered pocket coils. Between this and the next layer of coils is a lumbar support pad. The top of the mattress is covered with a two-inch pillow top and a Tencel cover. Tencel is known for being not only natural, deriving from wood cellulose, but is also durable, soft, absorbent and quick drying.WinkBeds also has a proprietary optional coolControl base that offers a unique temperature control feature. With the use of the included remote or downloadable app, customers can control the temperature of the bed and can program two different temperatures for either side. So, if you sleep hotter than your partner for example, the coolControl base will draw up cool air from the floor surface and bring it up into the mattress, providing a temperature change of up to 10 degrees. Customer reviews report that this mattress is heavy duty and well-built if a little bit heavy to lift and move. In terms of density, this is a high, thick mattress at 15 inches and the stability of the springs and the memory foam offer a decent amount of support for most people. Because of the pillow top, you won’t have a sinking in feel like memory foam and so some lightweight customers feel this bed is a bit too firm for them. That being said, Sleepopolis.com rates this mattress as a number six on their firmness scale with 10 being the firmest. 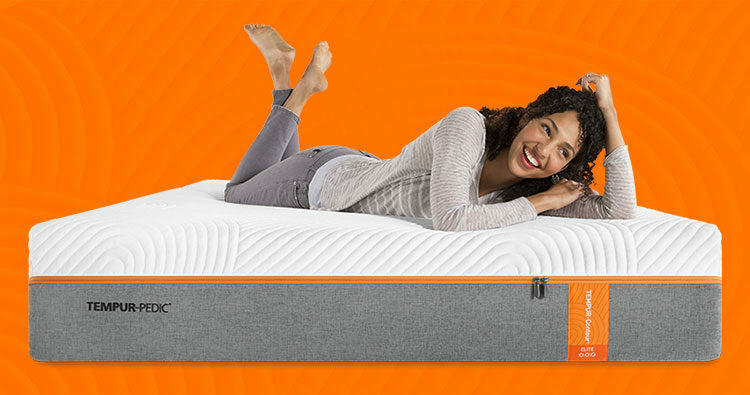 For a mattress with coils, customers report that this mattress has very little motion transfer and bounce compared to a completely innerspring mattress and the foam layers, plus the two-inch padding on the top absorb a lot of the movement.WinkBeds offer a nice 101-night sleep trial and a ten-year warranty. You want a hybrid foam/coil mattress: The Winkbeds mattress gives an option for those who don’t like the idea of an all foam mattress. You want to control the temperature of your bed: The coolControl base is a very unique feature if you prefer a different sleeping temperature than your partner. You like pillow top mattresses: If you want the support of a thick mattress but don’t want to the “sinking into” feel of an all memory foam bed, the Winkbeds mattress might be a good choice. The pillow top offers more of a “resting on top” feel than a sinking, “hugging” feel. You want a long trial period: WinkBeds can be tried for 101 days and if you are not fully satisfied at the end of this trial, they will give you a full refund and arrange to pick up the mattress for free. If you are prepared to shell out for a well-known, quality name brand with a great reputation then a Tempur-Pedic mattress might be for you. A luxury option, Tempur-Pedic mattresses don’t come cheap, but there is a reason for that. Consistently one of the highest rated mattresses on the market, a Tempur-Pedic mattress is a big investment but a safe one. Most people are familiar with the Tempur-Pedic name. A reputable company with over two decades of experience in the industry, they are well known because they offer a wide variety of mattresses for all people and they are made to last. The TEMPUR-Contour Supreme is the firmest mattress the company has and so it is great for heavy customers that find sagging and lack of support a problem. That being said, this mattress might not be for everyone. It is described by customers as very firm and so lightweight partners might find it too hard, especially those who sleep on their sides. On the other hand, heavy customers who sleep on their stomachs and backs are reporting this mattress is the best one for them. The bed is made with five layers, each one designed for a specific purpose. The top layer is made of memory foam at just over an inch thick. Under this is a support layer that is just under three inches thick. Finally, the base layer is a dense seven-inch layer of regular foam. All of these layers are then topped with a top cover that is supposed to not only be breathable and moisture wicking, but provide a bit of softness to conform to pressure points and distribute weight evenly. Because of the high density of this mattress and the fact that it has no springs, there is little to no movement when turning or when getting in and out of the bed so it’s a great option for people who are easily woken. This bed might also not be the option if you are looking for something made of all natural materials and some customers have commented on the strong gassing-off odor. They come with a hefty price tag but the bed is an investment with a good warranty and above all these beds have a great shelf life so the value is still there. You want a well-known brand name with history: Most people have heard of the Tempur-Pedic brand name and are familiar with them as a company from advertising. If you want to go with a company that isn’t as new as some of the others, the TEMPUR-Contour might be for you. A great choice in an all-natural hybrid mattress, the Avocado Green Mattress is getting great reviews from people of all body types and is a great choice for heavier customers. As a hybrid mattress, it offers the support of recycled steel coils, and the comfort of dense foam layers. The upper layers of the Avocado mattress are made from 100 percent natural tree based latex from sustainably managed trees in Asia. Natural latex is breathable and distributes heat evenly and it is also completely biodegradable and yet is a very resilient and tough material. Latex has a long life as well, so given the quality of materials in this mattress, the value here is great. Beneath the latex layers of the mattress are a base layer of eight-inch pocketed support coils that move independently. The coils are in specific zones to give extra support to the hips and shoulders as well as the lumbar region of the back. The top layer is also made with all natural materials. A comfortable layer of New Zealand wool is wrapped in a certified organic cotton cover. Both of these materials are designed to wick moisture. Wool is naturally anti-microbial and is also naturally fire retardant. Because of the coils, this mattress has a fair amount of bounce compared with mattresses that have an all foam construction. Because of this, this might not be the best choice of mattresses for light sleepers. As a hybrid mattress, the Avocado Green Mattress is built with a “gentle firm” feel. For heavier customers, this might not be enough thickness without the addition of the pillow top. However most heavier customers appreciate the firm feel of the latex layers and the support of the coils beneath. As well, many customers who are hot when they sleep appreciate that you don’t sink in as much with this mattress as with some with a memory foam top. All-in-all a great option if you are looking for an affordable firmer mattress made with all-natural materials as well as a great warranty and trial period. You want an all-natural bed: If you are sensitive to chemicals or are concerned about the materials your bed is made of, the Avocado Green Mattress is a great choice. 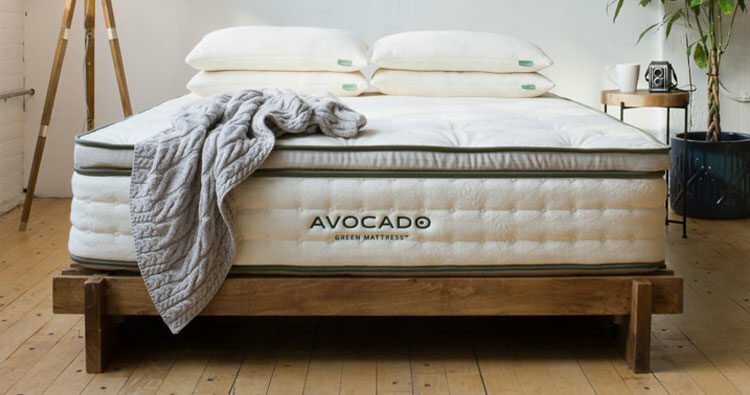 Made from sustainable, natural materials and with an eco-friendly company approach, an Avocado mattress is a responsible decision. You want a firm mattress without sinking in: Unlike a mattress that is made with a memory foam upper layer, the Avocado Green Mattress is a hybrid mattress, which means it offers firm stability and a “floating on top” feel rather than a sinking feel, especially if you use the mattress without the extra topper. You like to sleep solo: If motion transfer is no issue and you need a bed with a lot of stability, this mattress might be a good option. While it has the support of strong coil layers, a small amount of movement might be annoying to a light sleeper if you share the bed. If you want a long sleep trial period: If you want to have a longer period of time to determine if you like your mattress or not, the Avocado Green Mattress is a good choice. They offer a 100-night sleep trial period and a decent 10-year warranty against manufacturing defects. Based on our research, we feel that the Loom & Leaf Luxury Memory Foam Bed is the best choice of mattress for heavier people. They offer many of the features of a high-end luxury mattress at a much better price. It’s breathable, and cooling for heavy set people who sleep hot and has a cooling gel layer to help keep temperatures down. It’s made from eco-friendly materials and best of all comes in two comfort levels so you can be sure you are getting the level of firmness you need. Supportive, high density quality with a great warranty and overall great value, the Loom & Leaf Mattress is a clear winner in our books. Firmness: If you are heavier set look for a mattress that is medium firm to firm. A mattress that is too soft won’t be able to support your weight and you’ll end up with a sore back by morning. Thickness: Only a mattress with a thickness of around 12 inches or more is going to be able to support people who weigh more than 230 pounds. By investing in a thicker mattress, you can be sure it will be more likely to last and will be supportive under your weight. Breathability: Heavier people can sometimes be too hot at night and some mattresses only make you feel hotter. Look for a mattress that is made from breathable materials and works to whisk away moisture from the surface. Look for mattress covers made from natural materials or high tech man made fabrics that are known for breathability. Durability: More weight puts more pressure on coils or compresses foam over time. Look for a mattress that stands the test of time by seeking out highly rated beds that have been used by heavy customers over a long period of time. Motion Isolation: Motion isolation is important, particularly if you share your bed with someone else who is lighter than you. A good mattress isolates movement so that your movement doesn’t move the person next to you. Mattress stability is the key takeaway here. Value: Just because you need a thicker, firmer mattress doesn’t mean you want to break the bank. While thicker mattresses will cost more, a good purchase is about value–getting the most bang for the buck and a great buy for the quality. Warranty: The best mattress companies can back up their products with a good warranty. If they are not afraid to offer you a decent long term warranty against defects and issues, it’s probably a good sign that they are selling a product that they believe in.